This email reveals that the rescue and Chuck’s death were not as random as they seemed. Like the nightly changes in the layout of the Maze, those events, although appearing chaotic, were in fact not random at all. Once again, the novel suggests that what may seem like chaos can sometimes have an underlying order. She then writes that the boys will soon recall their memories and eventually understand that WICKED is good. She says that they’ll come to understand that all WICKED did to them was for the sake of humanity. She writes that the boys will be allowed a full night’s rest before stage two begins. The email ends with her writing that Group B’s trial results were just as good but that she needs more time to process the data. Plaue, Ethan. "The Maze Runner Epilogue." LitCharts. LitCharts LLC, 22 Jul 2015. Web. 22 Apr 2019. Plaue, Ethan. "The Maze Runner Epilogue." LitCharts LLC, July 22, 2015. 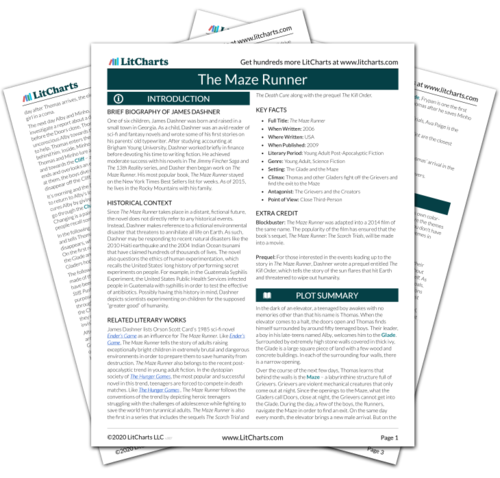 Retrieved April 22, 2019. https://www.litcharts.com/lit/the-maze-runner/epilogue.